THE TROUBLE with recipes printed in the newspaper is, they're printed on newspaper. To save them for future reference you have to cut them out, fold them up and put them away in some manner that makes sense for finding them later. Besides which, newsprint is just not made for long-term storage. Many people have asked for something more permanent: "Don't you have a cookbook?" Well, as of next month, yes, we will. 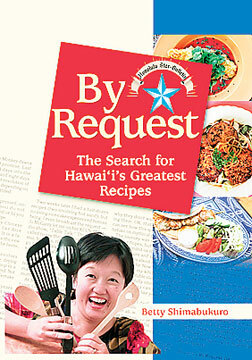 "By Request: The Search for Hawaii's Greatest Recipes" is a joint project of the Honolulu Star-Bulletin and Mutual Publishing, with a portion of the proceeds going to the Institute for Human Services. The cookbook is made up of recipes and photographs culled over my six years of writing "By Request." It's not everything -- in that many years of weekly production, the grand total surpasses what a commonsense cookbook can hold. But it does include the most delicious recipes, the most intriguing and the most deeply desired. Chapter 1, for example, is dedicated to the top five recipes, based on sheer number of requests: Chicken Alice's Chicken Wings, Tahitian Lanai Moa Ta Haari Chicken, Side Street Inn Pork Chops, Chinese Toong Mai rice cakes and a copycat Starbucks' low-fat oatcake. NOW, I know from my own cookbook explorations that most often you just want to get in, get the recipe and get out -- so you can get dinner on the table. Sorry, but "By Request" won't be that sort of cookbook. Each recipe comes with the story of its finding -- about the search, the recipe creator or that person's tips for making the dish come out right. "By Request" has always been fueled by curiosity as much as by the need to feed. The book comes out April 22, but pre-orders are being taken for $10, a discount on the cover price of $13.95. For every book sold, $1 will be donated to IHS for the first six months; 50 cents after that. An order form is on page D4 of today's newspaper. And if you lose today's paper, look for the form Sundays through Wednesdays for the next few weeks. You can also order through www.mutualpublishing.com.